TEQ4 is very proud to have been selected by the DIT (the UK Government’s Department of International Trade) as one of a handful of creative immersive technology businesses to represent the UK at November’s IAAPA Attractions Expo 2017 in Orlando, Florida – the largest international conference and trade show for the attractions industry. 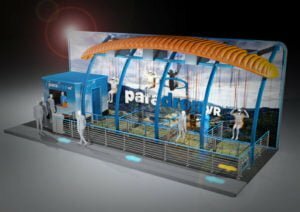 We’ll be at IAAPA from 13-17th November showing off the hugely exciting ParadropVR – the world’s first virtual reality paragliding experience. Developed by ex-UK special forces, ParadropVR has been designed specifically to offer an incredibly realistic paragliding experience. It uses highly accurate (and increasingly popular) virtual reality, boasts a small-footprint and has a high total hourly ride capacity, making ParadropVR perfect for amusement parks, family entertainment centers, zoos, museums and science centers. If you’re going to be at IAAPA and would like to get an exclusive look at ParadropVR and to meet the people behind the project, there are a limited number of slots available – on a first come, first served basis. Drop us an email to book in advance. Looking forward to hopefully seeing you at the show! In the meantime, click here for more info on ParadropVR.